hahahahahaha that was absolutely hilarious! wow wee i havent laughed so hard in ages… especially the xbox disc gag. yeah! GoldenLeticia, why don’t you start blowing homeless guys for small change? She must be a pretty bad lay if that were the case, OUCH. ^ Seriously? You think they live in lean-to shacks in the slums by choice? 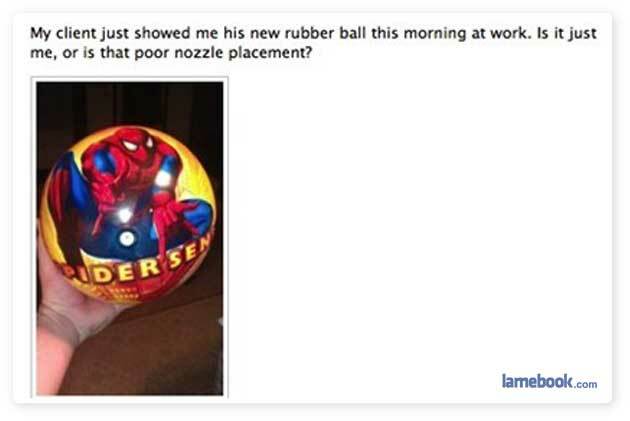 what kind of ‘client’ carries a rubber spiderman ball to ‘work’? Ms, I almost just posed the same question, instead I comment assuming she works in a daycare, and her clients are only 3. I was also wondering, as I’m sure some of you are familiar with p/s and the proper terminology, but just skip that. Pretty sure that guy is advertising the necessity to Photoshop his wang..
Maybe they’re not allowed to access the internet from work, so in their spare time they throw the ball at the retard who’s been hired for legal reasons. cheer up then, crusty. at least they got a spidey ball to throw at you.